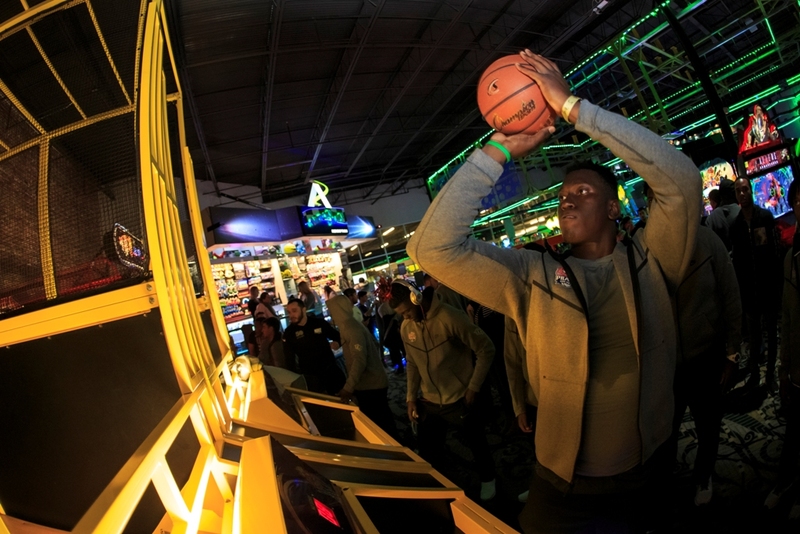 The UCF Knights (12) and Auburn Tigers (7) are preparing to play a special game on Jan. 1. 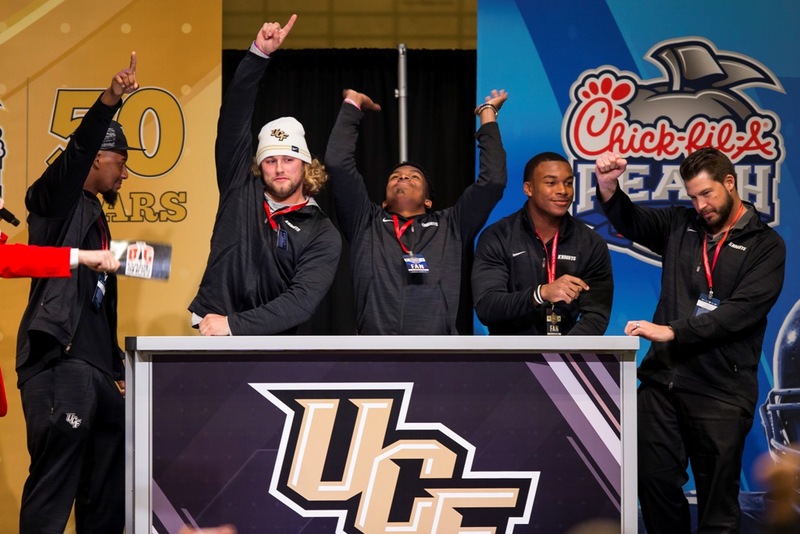 Not only is it the Chik-fil-A Peach Bowl’s 50th anniversary, with the teams battling it out in front of a sold out crowd, but it’s the last game that the UCF Knights will play with Scott Frost at the helm. 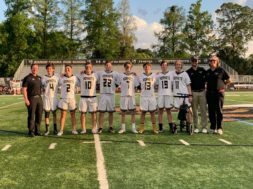 The team’s former head coach led them from a winless season to a perfect 12-0 in just two years. 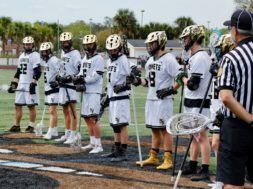 The UCF Knights made program history this year with their perfect season, and the final game clinched their third American Athletic Conference win. This will be UCF’s second straight bowl appearance and ninth overall. They are going into the Peach Bowl as the nation’s only undefeated team. Throughout the week, the team has been practicing in Mercedes-Benz Stadium by day and participating in bowl week activities by night. 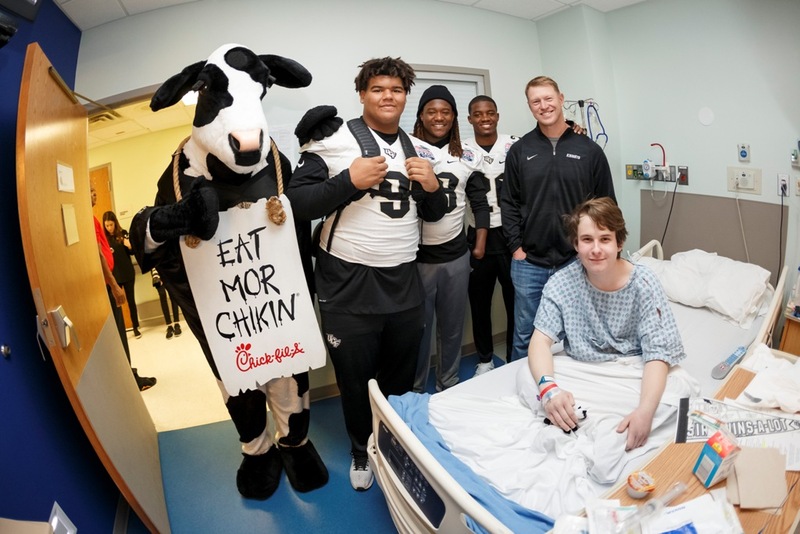 From racing at Andretti Indoor Karting and Games to visiting the kids at Scottish Rite Children’s Hospital, the UCF Knights have been staying busy. The UCF Knights visited kids at Scottish Rite Children's Hospital. The UCF Knights participating in the Battle for Bowl Week finale. 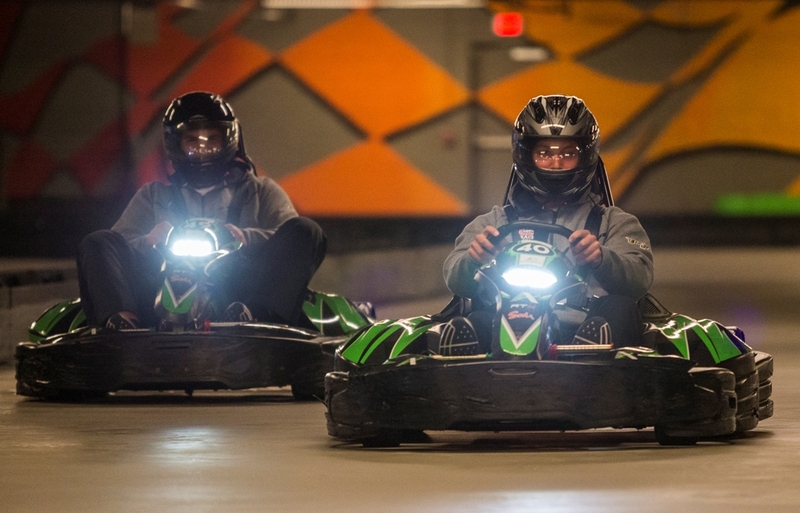 The UCF Knights visited Andretti Indoor Karting and Games during bowl week. 1. This marks the third time the Chick-fil-A Peach Bowl has been played on New Year’s Day and the first time the game has ever been played in the new Mercedes-Benz Stadium. 2. 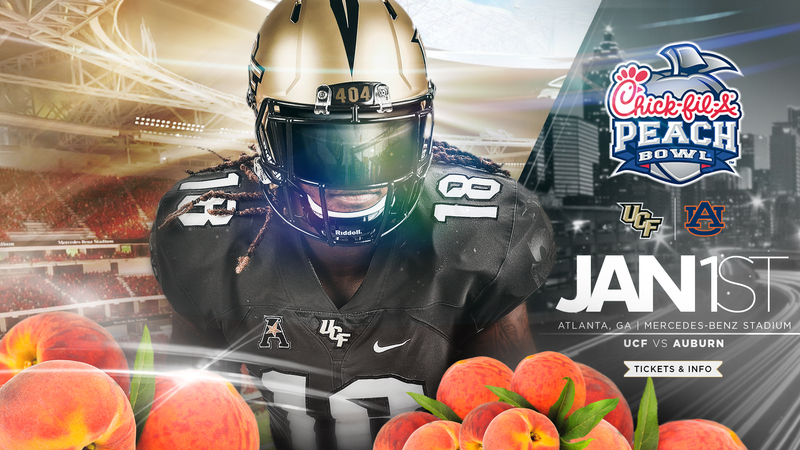 UCF will be making its first trip to the Chik-fil-A Peach Bowl, while Auburn will make its sixth appearance. Auburn currently holds a 4-1 record in the game, with its last appearance resulting in a 43-24 victory over Virginia in 2011. Auburn leads the all-time series with UCF 3-0, with the most recent meeting resulting in a 28-10 Auburn victory in 1999. 3. UCF enters the game as champions of the American Athletic Conference. The Knights are the only undefeated FBS team in the nation, recording the program’s first-ever perfect regular season, and currently hold the nation’s longest winning streak at 12 games. The Knights’ offense leads the nation in scoring (49.4 PPG) and UCF ranks top five in the nation in three additional categories: passing efficiency, total offense and turnover margin. 4. Auburn enters the game as SEC Western Division champions. The Tigers are the first-ever team to defeat two College Football Playoff No. 1-ranked teams in the same season. Auburn ranks in the top five in the SEC in passing, rushing, receiving, scoring and defense and ranks first in kicking. The Tigers are also top 10 in the nation in completion percentage, fewest penalty yards per game, fumbles recovered, scoring defense and team passing efficiency. All the fun in Atlanta starts at 8:30 a.m. on Jan. 1 with the official kickoff for game day: the Chik-fil-A Peach Bowl Parade. This free event will stretch throughout downtown Atlanta, beginning at the corner of Centennial Olympic Park Drive and Baker Street and concluding at FanFest in the Georgia World Congress Center. It will feature the pageantry of floats, classic cars, cheerleaders, mascots and the teams’ marching bands. The Chik-fil-A Peach Bowl FanFest, presented by Tyson, is a four-hour celebration that is family friendly. 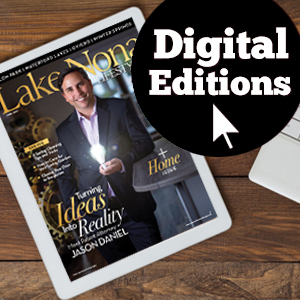 Expect food, interactive games, entertainment, official limited-edition merchandise, giveaways and more. A highlight of this event is a massive pep rally with the official bands and cheerleaders from both teams. FanFest will also feature a panelist discussion, moderated by media personality Rachel Baribeau, with Bill Curry, David Cutcliffe, Danny Ford, Larry Kehres and Steve Spurrier. Orlando’s hometown team, the undefeated UCF Knights, will take on the Auburn Tigers in the 50th annual Chick-fil-A Peach Bowl at 12:30 p.m. on New Year’s Day, and the game will air nationally on ESPN. If you’re not able to make it to Atlanta, check out a watch party here at home. 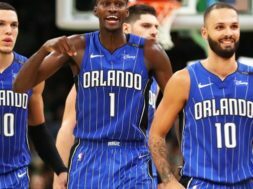 Watch the game with other fans at Orlando’s newest hot spot. Root for the UCF Knights will enjoying music by DJ Gonzerelli from 11:30 a.m. to 3:30 p.m., a tasty brunch menu and free shots with every UCF touchdown. UCF Young Alumni is hosting a watch party that will take over Wall Street Plaza. The Peach Bowl will be played inside Wall Street’s venues and on a giant TV in the plaza. All pre-registered UCF alumni who check in will receive a complimentary draft beer, while supplies last. There will also be giveaways, drink specials, brunch offers and food available for purchase.